It's been interesting to see over the last couple of months the number of schools in south east Wales who have 'gone Google'. If you have read some of my previous posts you will know that I've helped to introduce Google for Education into several primary schools across the region, and during a recent conversation with a primary school it became clear that this number is beginning to swell greatly. In one local authority we counted at least 17 primary and secondary schools using Google Apps, and these were just the ones that we were aware of. I certainly believe that number is going to grow quite significantly in that local authority, and also in surrounding LAs. During these conversations one Google Apps tool kept being flagged up as "amazing" - Google Classroom. I was obviously aware of it's potential in school, and heard lots of good things, but until now had never had a chance to use it with a class. For those who don't know what it is, Google Classroom is a free tool that comes with a Google for Education account. It allows teachers to simply set up an online classroom area where you can communicate with pupils, and share and collaborate on documents. The interface is easy to navigate, add content to, and intuitive. From a digital competence perspective, it's the ease with which the communication and collaboration aspect can be developed that's fantastic. Google Classroom seamlessly links with your Google Drive. 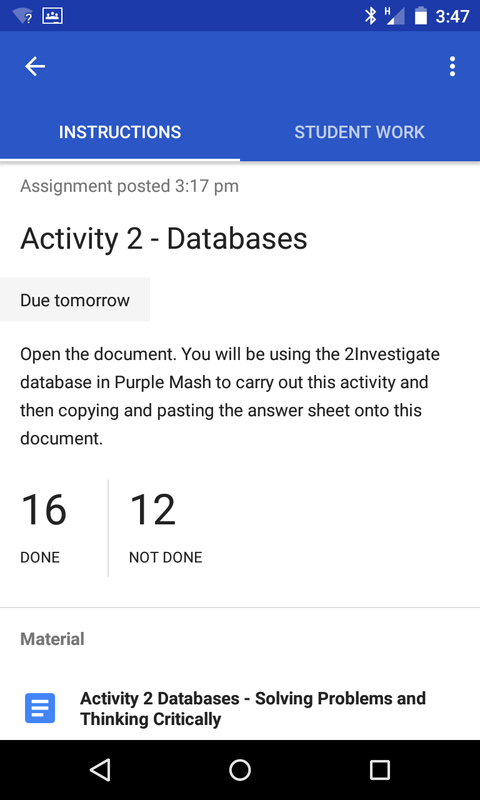 Documents are simply shared with the pupils in your class, either one document for all to collaborate on together, or one document sent to each pupil. 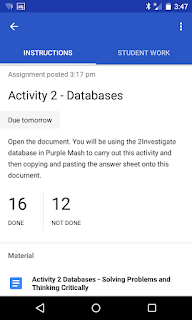 The killer function for me is that when the pupil has finished the task they hand in their work, which is automatically organised into assignment folders in my Google Drive. No more digging around shared network drives looking for evidence of the pupils work. You can then comment on (and grade if need be) the pupil's work and return it to them. For the last two weeks I've started working for one afternoon a week with a Year 6 class in my wife's primary school. I was asked to go in and deliver some lessons on databases, and thought this would be a really good opportunity to use Google Classroom to support the lessons. The school has introduced my ICT SoW, which is split into various activities around a particular strand of ICT. In the first week I had to initially introduce the pupils to Google for Education, making sure they could all log in. I then took them straight into Google Classroom. I then let them respond to an 'announcement', which got them very excited. Pupils were writing a short post about themselves, and were encouraged to respond to others. It was a good opportunity to discuss appropriate ways to talk to people online, and also to make them aware that anything they write can be seen by all the class. Within about 10mins we had about 150 comments! The actual lesson utilised an online database, which was queried to find out who were the culprits to various 'crimes'. I prepared a Google Doc which had the learning objective, some information about what a database is, a hyperlink to the website, and space where the pupils had to record their answers. At the end of the lesson the pupils then handed in their work using a button that appears at the top of their document. I was then able to see how many pupil had returned their work, open up each document, comment on what they had done and return it to them. After two lessons I'm really happy with how Google Classroom works, and can see why other schools like it too. The iPad and Android app work well, being able to add announcements, questions and assignments from those devices. This particular primary school is now beginning to use Classroom with the whole of KS2. It'll be interesting to have a conversation with the teachers next term to evaluate what they think of it. I also recently attended the Bett Show in London and sat in on a couple of Google presentations which were mainly about Classroom. It was great to see Alice Keeler there as I have followed her on Twitter for some time and often view her website. Just bought her book, "50 Things You Can Do With Google Classroom". Hopefully it'll give me some great ideas.